Do you value FPF? Become a supporting member! Where do you turn when your car is broken into? Or when you need to borrow a stroller, find a reliable mechanic, sell your couch, or track down your AWOL dog? Increasingly in Chittenden and Grand Isle Counties, people turn to their nearby neighbors through Front Porch Forum (FPF). After just three years of FPF’s service, 16,000 local households are participating. 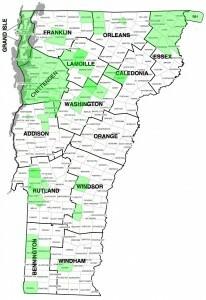 We publish in 140 neighborhoods across 25 towns in northwest Vermont… week in and week out. Local residents have posted 75,000 messages to their neighbors through FPF. Considering that the local newspaper costs $15/month and a daily coffee drink can exceed $60/month, what is FPF worth to you? To your community? Is my posting “allowed” on FPF? We get a version of this question again and again… “Is it allowed to post X on Front Porch Forum?” Well… for just about any “X” the answer is an emphatic and simple YES! Garage sale oct. 24 Rain or shine! How many Trick or Treaters? Want Gutters Cleaned? or storm doors Installed? need a free sofa sleeper? In today’s world, it is more acceptable to be depressed than to be lonely-yet loneliness appears to be the inevitable byproduct of our frenetic contemporary lifestyle. According to the 2004 General Social Survey, one out of four Americans talked to no one about something of importance to them during the last six months. Another remarkable fact emerged from the 2000 U.S. Census: more people are living alone today than at any point in the country’s history-fully 25 percent of households consist of one person only. In this crucial look at one of America’s few remaining taboo subjects-loneliness-Drs. Jacqueline Olds and Richard S. Schwartz set out to understand the cultural imperatives, psychological dynamics, and physical mechanisms underlying social isolation. In The Lonely American, cutting-edge research on the physiological and cognitive effects of social exclusion and emerging work in the neurobiology of attachment uncover startling, sobering ripple effects of loneliness in areas as varied as physical health, children’s emotional problems, substance abuse, and even global warming. Surprising new studies tell a grim truth about social isolation: being disconnected diminishes happiness, health, and longevity; increases aggression; and correlates with increasing rates of violent crime. Loneliness doesn’t apply simply to single people, either-today’s busy parents “cocoon” themselves by devoting most of their non-work hours to children, leaving little time for friends, and other forms of social contact, and unhealthily relying on the marriage to fulfill all social needs. As a core population of socially isolated individuals and families continues to balloon in size, it is more important than ever to understand the effects of a culture that idealizes busyness and self-reliance. It’s time to bring loneliness-a very real and little-discussed social epidemic with frightening consequences-out into the open, and find a way to navigate the tension between freedom and connection in our lives. This is one of the central problems that Front Porch Forum addresses… and why we get such strong and emotional responses from folks. Many people simply yearn to connect with their neighbors, and in this day and age that’s not easy to do. Enter FPF. A friend of mine, on Texas Hill Road, had his tank of home heating fuel siphoned and stolen. This happened sometime last Thursday night. The state police were notified of the robbery… The tank was recently filled so there was about 275 gals of fuel, therefore a large truck would have been needed to transport the fuel. The owner heard a sound and the automatic flood lights went on but was unable to see anyone. If anyone has any information about this please contact the Williston State Police. It’s a shame that someone would steal fuel from a long-time neighbor of ours. Especially when the fuel was to keep him warm this winter!! I hope they find the bums! Bundle up. Where is Front Porch Forum available? And we’re expanding to other areas in the coming months. Sign up or join our waitlist. FPF is free to local residents. Andy Schroepfer at Rackspace wrote recently about the future of email vs. social media, texting, etc. Some, like today’s nutty Wall Street Journal article, declare the demise and coming death of email. Oh, puh-lease. And we all have paper-less offices, and radio disappeared the day after TV arrived, and the U.S. Postal Service is closing up shop tomorrow. We definitely have a rapidly evolving communication and media landscape, but seldom do the stalwarts just disappear.